Colombia Airforce releases photos of their MAFFS II system, which was used in part of their annual emergency response training in September 2018. The Colombian Airforce was the first International Customer of the MAFFS II system, which was delivered by the MAFFS group, whom are the owners of all intellectual property for the MAFFS II system. 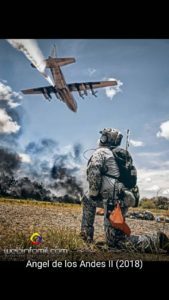 The MAFFS II system is the only certified by the United States Air Force (USFS) for Roll On /Roll Off firefighting missions aboard the C130 aircraft. You can find more information at www.maffs.com.